Apartment N. 130: It can accommodate up to 4 people, it is rented from 113 € per Night (not per person). 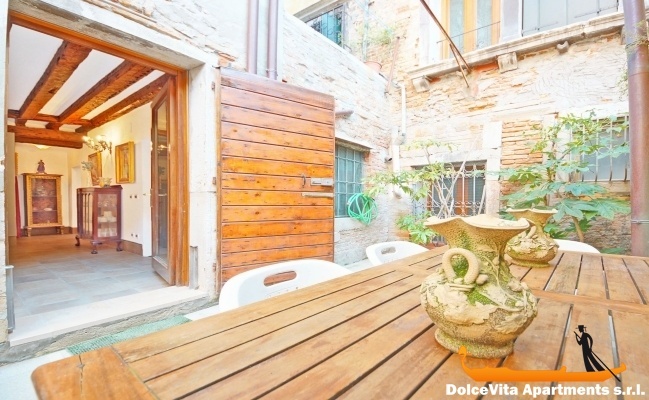 This lovely apartment in Venice is located in a beautiful and prestigious neighborhood of “San Maurizio” square, which hosts the famous antique market four times during the year. The apartment is on the ground floor and it has a beautiful private courtyard, there are two bathrooms with showers, one double bedroom plus a comfortable sofa bed in the living room and a well equipped kitchen. The apartment is located a few minutes walk from the Accademia Bridge and the gorgeous sunny squares of St. Angel and St. Stephen. St. Mark square is less than ten minutes walk away. Comfortable, everything you would need for a short break was provided, in a truly excellent location for exploring Venice on foot. Elisabetta very helpful. Service was good, everything worked nicely and we had no problems at all. We found the apartment comfortable, clean tidy and well equipped with utensils and accessories. 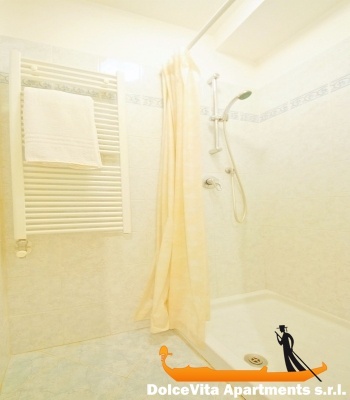 We enclosed a picture of our wonderful holiday in Venice. Our stay in Venice was excellent. 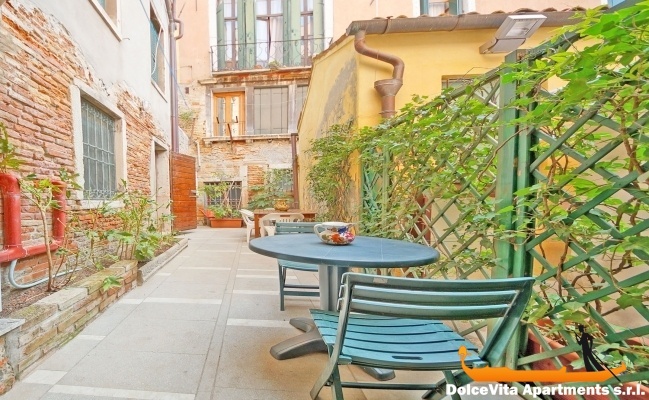 The apartment is right in the centre of Venice, close to everything but still very quiet. We particularly appreciated the space, the modern facilities and, of course, the private terrace. We do not want to say anymore good things about the place as we risk that it will not be possible to book it next time we go to Venice. Thanks for the great and smooth service. It was extremely simple and transparent. The apartment is conveniently located. We were well received and well advised. We attribute the score of 4/5. Best regards. 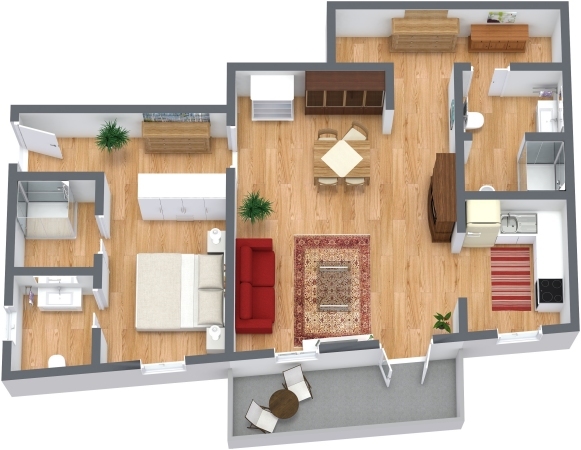 The apartment is clean and the size is surprising with two full bathrooms. Obviously the terrace is unique. absolutely impeccable Elisabetta who ensured our transport on arrival and departure, and whose presence and availability were reassuring at any time. 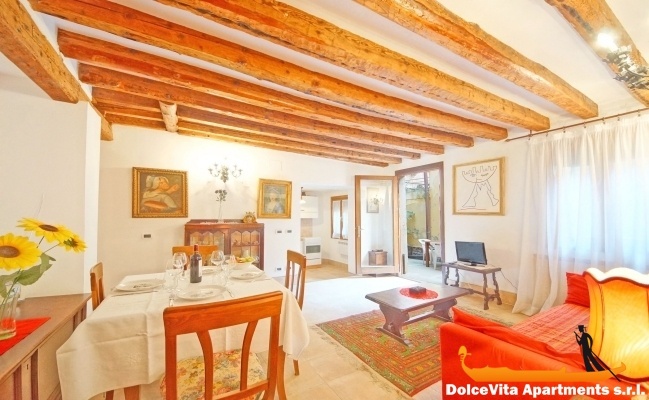 The place where is located the apartment is absolutely perfect: 6 minutes from St Mark's Square and 7 minutes from the Rialto bridge, 4 minutes from the Bridge Accademia. In short, an unforgettable week. The apartment 130, I would definitely recommend it to friends /relatives. 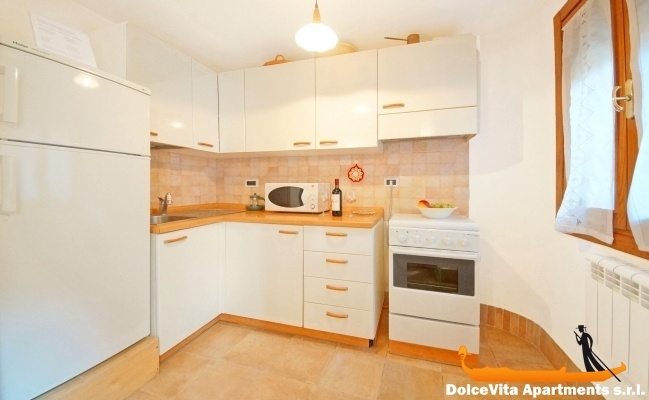 very clean and spacious apartment for 4 people, 2 adults and children; Apartment very well located for sightseeing, we can do everything on foot, 5 minutes from square San Marco, the RIALTO bridge. THE TERRACE is very significant to take meals outside; there was the minimum to start our stay, salt, sugar, coffee, vinegar oil. Good morning we were welcomed very well by Elizabeth; no problem, well located, comfortable and we put 5 to Elizabeth. See you soon, the next year. It is comfortable, clean and well appointed, ideal for 4 people (couple with 2 children). Its strong point is undoubtedly its location. 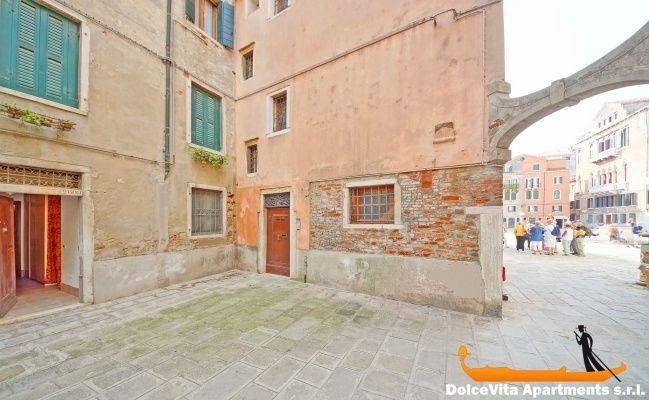 Very close to San Marco Square, it is also close to Rialto (and its market) and Accademia, and all the necessary amenities (supermarket, restaurants, many shops of all kinds, Vaporetto stations ...). Elisabetta, the owner of the apartment reserved us a very good welcome and gave us all the necessary information to make our stay enjoyable, including the location of the nearest supermarket. We will keep very good memories of this stay in Venice. Apartment N.130 added to our enjoyment of Venice. Firstly, it is very central, only a five minute walk from San Marco square, La Fenice opera house and the Gallerie dell’Accademia. The owner, Elisa, met us at the water bus station and the walk to the apartment is two minutes. She was very gracious and showed us all the workings of the apartment. It is an advantage to be on the ground floor and to have a garden and tables for eating outside. This is rare in Venice. The apartment is good value in an expensive city. 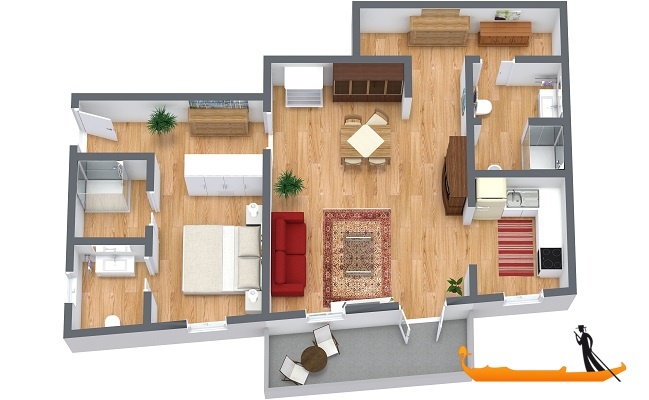 We were quite happy with the apartment, good location & generally adequate facilities. Just a few points, as we arrived on Sunday evening it would have been nice for a bottle of water in the fridge & maybe some milk. 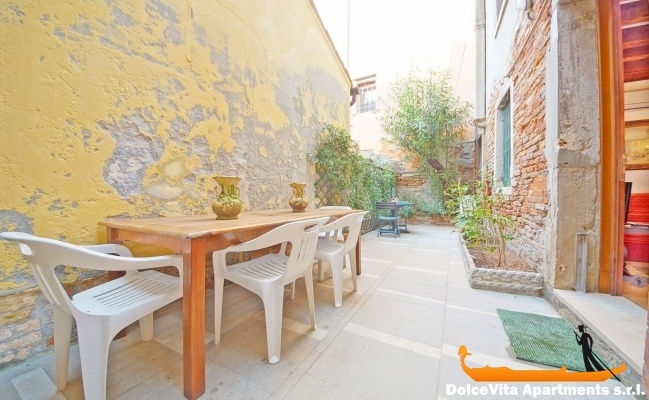 This apartment N 130 is very well located in Venice, pleasant with a small yard where it is good to find quiet after a day visiting different places to see. Elisabetta welcomed us warmly, she gave us very useful information and she was easily contactable if we had any worries. We were therefore entirely satisfied with our stay and we hope to come back and we will without hesitation by your intermediary. Again thank you for the ease to book an apartment for your site and the kindness of Elisabetta during our stay. Charming, well located, very clean, nice little courtyard, welcoming owner. Situated in very convenient location, spacious and comfortable interior, two bathrooms, the owner is very courteous and helpful. The apartment 130 allowed a wonderful holiday,very central location, 5 min walk to S Marco, 5 minutes from one of the (few) supermarkets in Venice. The apartment is equipped with everything. If I can I'll go back. Simple, clean, functional (2x toilet-showers) but a bit sad and not very bright, little lighting bedroom!